I just finished reading an interesting article a few minutes ago. 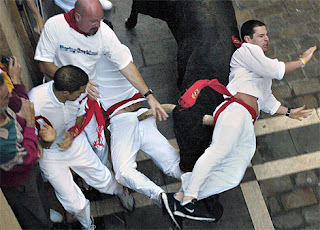 Two brothers were speared during the annual running of the bulls craziness in Madrid, Spain. One of the bros. recently overcame cancer so each year they look to do something exciting. This year they got a little extra excitement courtesy of a really big bull. Great story, great faith. Regardless of what you think of these guys, they decided to take a stab (bad pun)at taking a step of faith. Most of us (including me) don't normally step out and do risky things & have great faith because...well...the picture above. Risk can equal pain. It reminds me of the story of Rack, Shaq & Benny (the names have been changed in honor of veggie tales) in the book of Daniel. These guys were so brave, they had so much faith. Kinda. They are the story that I've heard all of my life that encourages followers of the one true God to stand up and believe against all odds knowing that God will come through no matter what. They had superhuman faith and simply believed they would make it without a doubt. They were fearless as all great people of faith are, right? The King was pretty ticked (read the story for the context) at their disobedience for not worshiping him and he ordered them to be burned alive. Here's what they said in response in Daniel 3, "If we are thrown into the blazing furnace, the God we serve is able to save us from it, and he will rescue us from your hand, O king. 18 But even if he does not, we want you to know, O king, that we will not serve your gods or worship the image of gold you have set up." They were going to run against the bulls regardless of the odds I guess you could say. One interesting thought though. They weren't so sure they were going to make it, but they followed God along the path anyway. What path of faith is God calling you to take this week that you're not so sure you want to? If you're afraid, do it anyway! If you don't outrun the bull, at least you'll have a great story and no regrets!